Blac Chyna and Rob Kardashian welcomed baby Dream Kardashian into the world on Sunday's Rob & Chyna Baby Special! On the show, we saw Rob and Chyna prepare for the birth of their baby girl and Rob explained that he and Chyna are in a "really really great place with each other" after "communicating our problems with each other more." During the episode, the couple learned that Chyna would have to have a C-section. During her first pregnancy with King Cairo, Chyna had a C-section because he didn't "drop in time," and that is exactly what happened with baby Dream. Even though Rob was hoping Chyna would have a "VBAC" birth, Chyna's doctor told her a C-section would have to happen. Then when the day of the C-section arrived, Chyna broke down in tears and admitted she was "scared." So how did she handle the delivery? Take a look at the recap to find out and to see Kim Kardashian make an appearance in the delivery room! After getting a 4D sonogram of baby Dream, Chyna FaceTimes Kris Jenner to show her the adorable photo and talks about her relationship with her soon-to-be mother-in-law. "Everybody always talks about mother-in-laws and how they can be," Chyna says in the clip above. "But Kris is totally different, you know always willing to give me personal, good advice. With everything from like health insurance to talking to her about Rob and future plans and everything in between." She then says, "Kris is like a second mother to me." When Scott Disick stops by Rob's house, the two talk about baby Dream's upcoming birth and how Chyna is thinking about having a second C-section. "I think she's gonna do a C-section," Rob tells Scott. "Yeah she did it with her first kid...but you could only do so many of those. So I'm saying you can only have a certain amount of kids if you do C-section." Rob wants a large family, so Chyna is willing to do a natural birth if she can. He then explains, "Chyna had a C-section originally because King didn't drop in time and you can't just go around having C-section after C-section. I want her to have a VBAC cause I've always wanted to have a lot of kids...a repeat C-section would make that a lot more complicated." 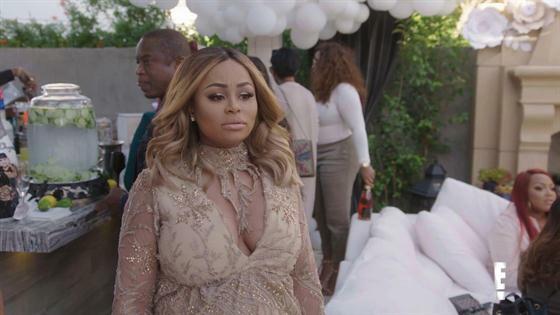 Is Tokyo Toni Getting Lit at Blac Chyna's Baby Shower? During her first pregnancy with her and Tyga's son King Cairo, Chyna didn't even have a baby shower. Chyna explains that she had to "hide" the pregnancy, which she said was "not a good feeling." So this time around, having a baby shower is extra special. And even though the Kardashians aren't able to make it to the shower because they're away at Paris Fashion Week, they still send presents for Chyna and the baby. Take a look at the clip above to see Chyna talk about her first pregnancy and see what the Kardashians gave to Chyna and baby Dream! Both Rob and Chyna are admittedly "not happy" in each other's houses and while Rob has been staying at Chyna's most of the time the couple still wants to find their new dream home where they can start fresh as a family. But since it's so close to baby Dream's due date, Chyna doesn't want to deal with moving. So after a talk with his friend Eddie, Rob realizes that it will be better to wait until after the baby is born to find a house. "Definitely can't be moving right this minute," Rob tells Chyna. "So the plan should be we'll just stay at your house, get it all ready for when we come home with the baby, get comfortable and when the time's right we'll find a house together and it will be good." Chyna agrees and tells Rob she's "excited" to decorate a baby room in her house. After Chyna goes to an appointment with Dr. Crane, she learns that baby Dream still hasn't "dropped." "I'm stressed cause I know Rob really wants a big family," Chyna says. "The doctor decided I do have to get a C-section, and it's not something that I like chose to do, it's something that my body just won't allow me to do. So breaking the news to Rob is really difficult." Chyna then tells Rob that the baby hasn't dropped and explains, "So I had to schedule the C-section." But Rob handles it well and tells Chyna, "Wow, OK. That's good you figured it out, know what you're gonna do now." He then explains, "Originally of course I wanted Chyna to have a VBAC because I always wanted to have more kids and a repeat C-section would make things way more complicated. So of course if the woman I love could avoid going under the knife, then I would prefer that." Chyna's mom Tokyo Toni and Kris are about to reunite for the first time in years and Chyna admits she's "worried" because of their history. "My mom and miss Kris actually met three years ago and they haven't seen each other since," Chyna explains. "When Tyga came out with Kylie, my mom had went and took it to social media. In defending me, the things that she said was a little bit extreme and maybe offended some of them." But when Rob and Chyna sit down with their moms everything goes well and Tokyo Toni and Kris become "united." And when they have to decide which grandmother will be in the room when Chyna gives birth, Tokyo Toni generously offers to let Kris be in the room because this is Rob's first child and Tokyo Toni was there for Chyna when she gave birth to her first child King Cairo. "That really was so heartwarming," Kris says. "You don't know that many people that would be as selfless. It was an olive branch and I really thought that was cool." 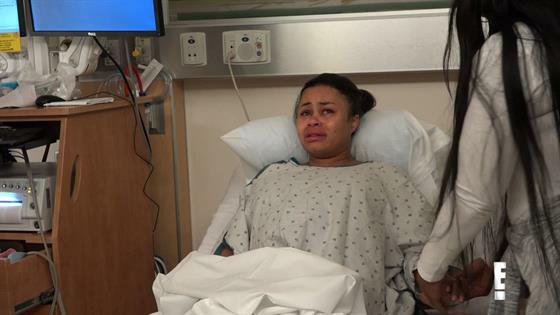 While being brought into her hospital room, Chyna starts hysterically crying over fears of having a C-section. Chyna explains, "For some reason I'm so scared. I just cannot get this C-section off of my mind." But with the help of her mom and Rob and her friends and hearing the baby's heartbeat, Chyna is about to feel a little more calm but admits she's still "really nervous." Chyna is then taken to the delivery room where she delivers a 7 pound, 5 ounce baby Dream via C-section with Rob and Kris by her side! "When I see baby dream for the first time, I'm definitely happy to see that she's healthy," Rob says. "She's just a little cute baby and it's pretty wild. Now she's here with us, it's pretty cool." Rob continues, "It's definitely crazy to see Dream looks just like me, looks just like my dad. I know my dad's looking down and he's super excited to add a beautiful Armenian baby to our family." While holding baby Dream, Chyna says, "Holding my baby, this just makes me feel so good because she's healthy and she's fine and she's so cute, she looks just like Rob! And never in a million years would I think that I would have King and I would have Dream and a man that actually loves me and that's always supportive and there for me." See Rob Kardashian Meet Daughter Dream for the First Time in Rob & Chyna Baby Special Sneak Peek! Shortly after the birth of Dream, the Kardashians start to arrive to visit the couple and their new baby! When Khloe Kardashian arrives she says, "Oh my God, she is so beautiful!" Kim then FaceTimes Rob and Chyna with Kanye West and when they show baby Dream, Kim says, "Oh my gosh, she's so cute! Oh my gosh she looks just like Rob, don't you think?" "Uh exactly like Rob!" Chyna replies. Kanye then tells the couple that Dream is "so cute" and says "congratulations!" After the phone call and having Kris, Khloe, Kourtney Kardashian and Scott stop by the hospital, Rob says, "It's definitely very nice to see everybody." He continues, "Khloe was out of the state, she took a four hour drive from Cleveland and then she hopped on a plane and then she came all the way straight from the airport to the hospital. Kourtney and Scott were literally leaving for Mexico and they came super early. It makes me very happy that everybody came to support and be there for Chyna and me. I've been super MIA for years so for them to make an effort and to really do what they can to be there just meant a lot to me." King Cairo then arrives at the hospital to meet his baby sister and when Chyna sees her family all together she says, "This is really a dream come true."